Starting at just $2695. 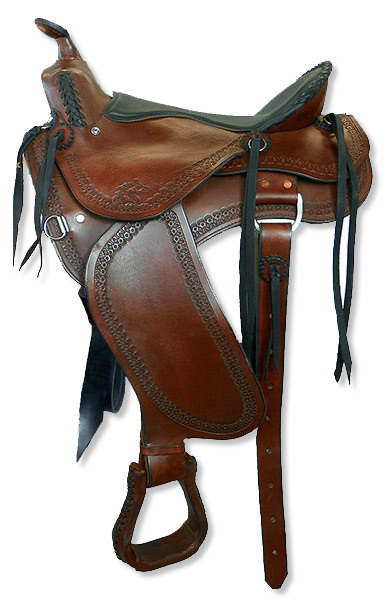 Our Custom Western Trail Saddles come complete with western or three point rigging. The back cinch and rear jockey are included. The fuller western style skirts are available in either square or butterfly style. Most western trail saddles weigh anywhere from 35 up to over 50 pounds. Our Western Trail Saddles weigh approximately 25 pounds in a 15 inch seat. Endurance racing has taught us exactly what it takes to keep a horse and rider comfortable for 100 miles. All of the same comfort features have been packaged into our western trail saddles and they are an absolute delight to ride! Each Custom Synergist Saddle is sculpted out for the rider’s thighs with specific seat bone depressions for a custom shaped seat creating the most comfortable seat possible. Design features like free swinging fenders to alleviate joint pain on longer rides and for extra comfort while trail riding, seats can be finished with sheepskin or stitch down padded seats with either extra foam or Supracor Honeycomb padding. Another option are EZ Ride Stirrups which are wider and deeper than traditional Western stirrups. They are five inches wide and four inches deep and allow for excellent weight distribution for the foot. A thick shock absorbing EVA Foam pad provides comfort for the knees and back and helps cut down on rider fatigue. 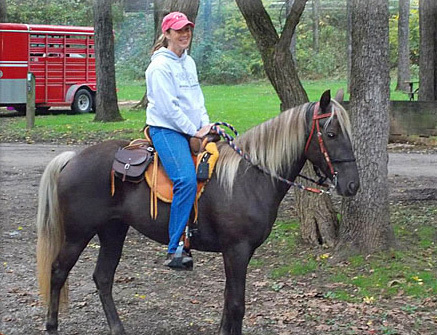 The patented top bar also absorbs shock from the horse and long hours in the saddle. Double wrapped horn, lariat holder, removable saddle bags, rifle scabbard, Cheyenne roll and Leatherman holder are very popular options for our western trail saddles. And since we are custom shop, everything we make is handmade to order. If you don’t see what you want, please feel free to talk to us about your ideas. And as always the patented EQUImeasure Kit is included with every custom saddle order to fine tune the saddle fit for your horse or mule. This ensures that your best friend will be as comfortable as you are mile after mile down the trail.